Author’s Note: Something fairly big happened in our immigration journey in the past few months, news that, given how much of a watershed moment it represents, I really would have expected myself to have shared sooner. And yet, for reasons I explore below, I have been mulling over how to share, or perhaps unconsciously putting off the sharing. Several years ago when we were writing Amor and Exile, and I had more time to figure out how to write about and share my experience; and it wasn’t as difficult to simply give myself the creative space for my story to bubble forth. Nowadays, finding time for reflection, or taking an idea and expanding it, is a rare luxury. But given this new development, I’ve kept asking myself, what can I say about this? It’s hard to know what to say when you’re still getting your bearings. But then good ol’ Fourth of July approached, stirring memories and feelings about the US of A, and soon after emerged a question, the answer to which is at the heart of where we stand for the next few years. This is a work in progress, friends. I want to know: “how can I, a person who rarely takes no for an answer, who has fought and won many battles, campaigns, and endured daily struggles, who knows what she wants and how to get it, whose nickname is ‘stubborn,’ ‘thorough,’ and whose very name means leader of the people; how can I be stuck in this multiyear limbo… how can I be on the cusp of the very opportunity for freedom that we ostensibly have been seeking for the last 16 years… how can I finally have arrived at the moment of truth, the time to move forward, the chance to capitalize; and yet, all I can seem to do is ponder the possibility. Wouldn’t it seem that, after 10 (closer to 11 now) years of exile that I’d at least have gotten the pondering out of the way? Or was it that I was so protective of my heart, after how badly it’d been hurt previously, after those first years of lawyer visits, that I wouldn’t even allow myself to entertain the possibility of a door opening, couldn’t let myself be deluded into the idea that a future back in the U.S. could be possible, lest it be a cruel joke, as it has been for so many people, and could very easily be for us? And yet now, it seems one nod has been given, the I-130 sort. I’m not even sure exactly what it means. Yes, you (to Margo), we acknowledge you claim you may have the right to a spouse visa based on the claim that you are married to an American. Is that what that means? That doesn’t include the several dozen other steps yet to be taken en route to the (still) possible visa (never a guarantee, even after paying the rest of the estimated costs for the whole application process, approx. 7500 USD – and that’s more than half of what I make in a year now to support our whole family, even as an employee of the US embassy). And so, just like that, a new reality, a door has opened, and now a decision must be made. Or so it seems. And so the idealistic leader who got this whole ball rolling in the first place looks at the troops and says, “what are you all waiting for?” But the spiteful little girl, the one who thought, you didn’t want to play with me, so now I’m going to ignore you, is sulking in the shadows. The worn-out working mom who’s been pulling 50 hour work weeks regularly just wants to veg on the couch. The incessant reader of sensationally negative news about the racially charged violence in the U.S. is cowering indoors, freaked about the potential harm she could lead her family into with a move back to the States, not unlike the fear some Americans experience upon absorbing negative press about Mexico (whether that’s a well-founded fear or not is up for debate at another date). The ever-skeptical accountant who takes one look at the scant balance sheet and shakes her head, catching the glance of the ever-practical logistics planner, who folds her arms over her chest and sighs, imagining the gargantuan tasks ahead to relocate a family all the while aligned with the intricacies of an unpredictable immigration application process ultimately leading to a job search for a rather scattered boss who’s been out of her home nation for 11 yrs. And hence, the conductor has her hand on the chain, wanting to blow that whistle, but the VIP passengers haven’t quite made it onto the train, which is still idling in the station. Yes, we are idling in limbo, and I’d really like to know why. Uncle Sam, it is because you (inadvertently, I’ll allow you – I’m still that forgiving) forced out one of your own with friendly fire and she’s spent too much time and energy healing her wounds in a foreign land to be able to come home? Or is it that lovely México has truly seduced me with all her charms and I am now hopelessly under her spell? Is it possible that I couldn’t have foreseen that in the end, it would be a little of both? And just like that, the I-130 was approved. And now I, a daughter of liberty, am attempting to summon the metaphorical troops, to brave what’s next. Whether that’s figuring how in sam hell we are going to afford this, whether our chances of waiver approval are the best or not, whether it’s the wisest investment to make when we have so little to invest, whether my family can bounce back from the pinball effect of the last twenty years of international migration, whether I really know my country anymore, whether I can or have to or will ever be able to or should let go of Mexico after seeing me through and providing me refuge and sustenance during some pretty dark times in the last eleven years, or whether I can ever forgive my country for being the main cause of all this mind-bending anguish in the first place, and whether the moment will ever arrive where the fireworks of happiness and relief rain down over us when we look back and say, “we’re done with this” …. whether that day will ever come, remains to be seen. Even if I were waiting, I wouldn’t even be able to listen in to the announcement, because I’ll be teaching English (I currently work nights) while it happens. Part of me it not really waiting at all though. I was, for a few months. I wrote and circulated an open letter to President Obama in August when it became clear the plan for executive action was in the works. I spoke with Center for Public Integrity reporter Susan Ferriss about my thin hopes for inclusion earlier this week for her piece, “U.S. spouses of ousted immigrants await Obama plan.” However, when recent reports began to point to a probable emphasis on relief for parents of U.S. citizen children, I knew we’d probably be waiting this one out. There will likely also be the perfunctory nod to “highly-skilled” workers. There *might* be a bone thrown in for spouses of U.S. citizens via extended “Parole in Place,” but whether that will happen or not is yet to be seen, and even if it were, it probably would not extend to any of those undocumented spouses of those U.S. citizens who happen to be outside of the country. No matter what happens, we will have to be clear about what this executive action is and what it’s not. The run-up to this executive action is being billed by some as “fixing the broken immigration system,” but please. You can’t possibly argue that giving tenuous relief to a small fraction of the individuals who need reform is a fix of a broken system. As immigration lawyer and advocate Prerna Lal puts it, she’s “still concerned about the millions left out by the plan specifics.” So this executive action is a Band-Aid, at best. Of course, human rights advocates like Ellin Jimmerson, Director of The Second Cooler, a documentary about the wide human rights offenses committed by the immigration system, narrated by Martin Sheen, have been saying it all along: if widespread human rights aren’t advanced by immigration reform, in the end, it’s not net progress. Sure, it’s a step, albeit small one. Even Obama knows that. Advocates and legislators alike believe that no matter the reach of this executive action, it’s no substitute for Congressional reform. ‘Course, I won’t be alone in this, hundreds of thousands, probably millions of us will get left out. But this seems to be a recurring pattern, one that I’m not sure will ever be entirely rectified, even by a bill as large as HR15, for reasons which activists like Jimmerson expand on amply. Which is why, for the moment, I am boycotting the waiting game. In my final chapters in Amor and Exile, I describe how I’ve toyed with the idea of pulling out of the waiting game entirely, not willing anymore to pin my life hopes on an act of Congress or an executive action such as the one on November 20th, 2014. Ironically, November 20th is the Anniversary of the Mexican Revolution. I wonder if that was just coincidental? Most everyone down here is working today because we already celebrated the occasion on Monday (they do long weekends early), but instead of going to the downtown parade or to a party, I spent it with the editorial team for Amor y Exilio—the Spanish translation of Amor and Exile that is currently underway. 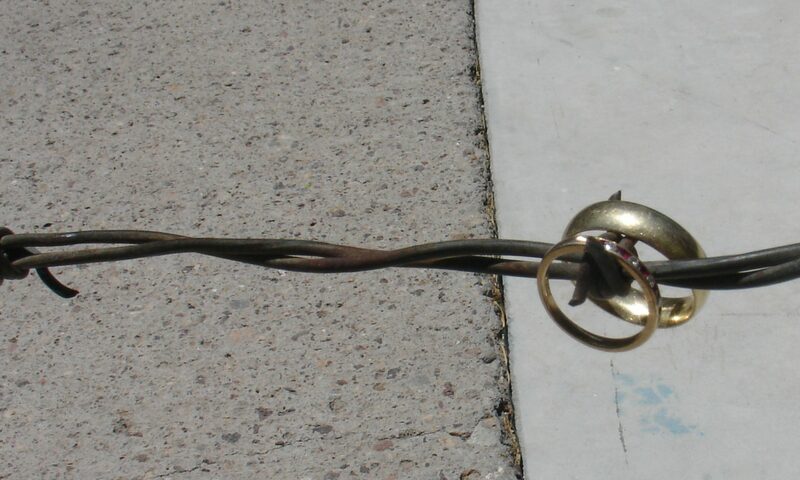 Even with the question of “did we miss out?” potentially shadowing over me during the aftermath of executive action, I would rather take the bull by the horns when it comes to the possibility of arrepentimiento. Rather than regret or question any of my past decisions to move to Mexico, to make this leap of faith, pasa lo que pasa, I would say no, I have no regrets. I prefer to embrace the fact that my husband was duly safe, at no risk of detention in these last 8 years. I am grateful for the freedom to have built our own home, in a lovely climate, and to have made lovely friends and to be making a life for ourselves. Sure, it’s nice to think of what the future could hold when and if my husband is permitted to travel and/or reside alongside my daughter and I to my home country. Yes, I will be frustrated if the system once again fails to reward people who are trying to do the right thing. And there will still be that glaring recollection that Congress’s failure to move forward on a real fix is what’s brought us to this point. But our time has not yet arrived. And so in the meantime, I see no reason to wait—just every reason to keep trying to move forward. We’ll also try to keep smiling, because if we don’t laugh about this, we’ll cry. Photo of the author and her husband from 2009 in San Mateo, California. P.S. Today’s featured image was chosen for no other reason than it’s throwback Thursday, and it’s our 10-year wedding anniversary in just under one month. Sharing my story and my opinions about immigration and reform has always created a haphazard mix of cynicism and optimism. Cynicism due to the lack of political will in Washington for so many years to create humane immigration policies. Optimism because no matter how many people I talk to, I always meet people who are outraged to hear our story and what happened to us as a result of draconian immigration laws. My experience during our two most recent events in Mexico — in Patzcuaro, Michoacan and in Guanajuato, GTO — were no exception. Given the fact that Amor and Exile was a moonlighting project for both of us authors, we have limited amount of time to devote to its promotion, beyond social media. And being an individual affected by the “broken immigration system,” I take the lack of forward progress in these affairs particularly personally. So as invitations started to come during 2014 to give talks in different parts of Mexico, I was super delighted to know that this issue is important to others beside my immediate family and allies. The trip to Patzcuaro was sponsored by the Patzcuaro and neighboring Morelia book clubs, hosted by Victoria Ryan of Hotel Casa Encantada, with Dara Stillman organizing. Although the list of incidental benefits to anyone in exile is short, for me, this trip ranked high on the list — 3 nights in an incredibly gorgeous B & B in the heart of a quaint Mexican mountain town known for its Dia de los Muertos celebrations on Isla Janitzio in Lago Patzcuaro. In addition to the official event on May 9th, Margo and I spent countless hours discussing the issue with dozens of expats who were extremely interested in the issue and our story. Many people expressed a lot of disgust and frustration with U.S. immigration policies for their inflexibility and inhumanity. The event with this crowd was seminal for me in a way because both individually and collectively, they encouraged me to “let loose” a little more in my political opinions on the issue. In the past, when in the public eye, I tend to make a lot of effort to frame things diplomatically, for fear of being considered inflammatory or controversial. But at the Patzcuaro event, since the people in our audience asked me to, I felt free to express my true feelings about a specific issue without worrying about how I said it. 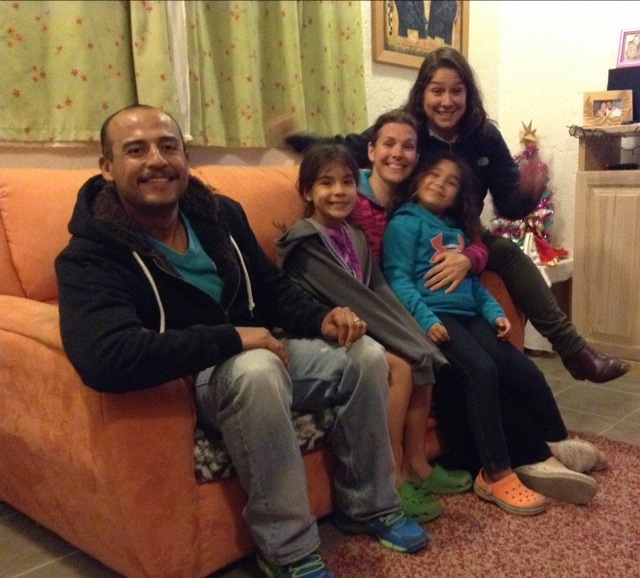 Nicole and family with Dara Stillman and Victoria Ryan in Patzcuaro, Michoacan. 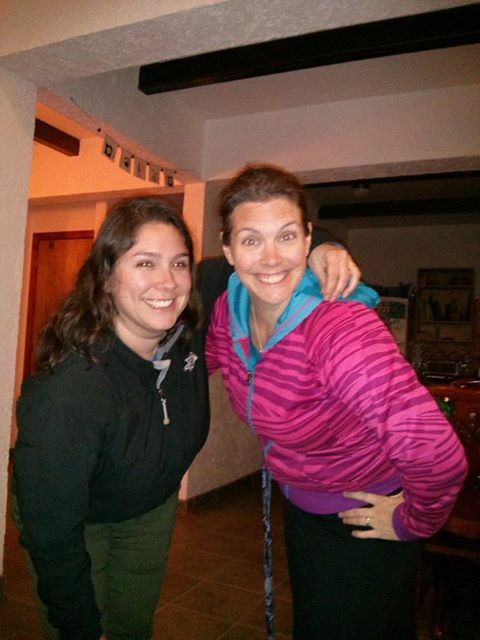 A few uncanny coincidences also occurred in Patzcuaro. The first was that we were taken to a place that my family and I had stayed in the year before our daughter was born. We had the opportunity to converse at length with the owner, a Mexico City born intellectual who is an artist in his own right. Next, I found out that the Buddhist monk/author who had greatly helped me during my first years in Mexico had stayed across town while writing one of his books. I was invited to visit the retreat center, Casa Werma, and its amazingly beautiful grounds the day before we left. My hosts, Rine and Kai, direct the center and also offer workshops on meditation. After receiving a private session on meditation, I couldn’t help but wonder what forces were at work in the universe to introduce me to my husband 15 years ago, to the works of Chogyam Trungpa Rinpoche 13 years ago, to relocate to Mexico, struggle with relocation and more deeply understand the meaning of Buddhist wisdom as a direct result of the exile 8 years ago, begin to write of my own journey in exile 3 years ago, and then walk the same grounds where Rinpoche had written about the wisdom of “groundlessness” on Mexican soil this year. Rine called them “auspicious coincidences.” I fancy that something is going on beyond what I’ve directly perceived, and this kind of knowledge fuels my resolve to continue with this path. In Guanajuato this past weekend and yesterday, although the events were less coincidental than Patzcuaro, they were no less auspicious. It was our first invitation to speak to a law class, and we were pleased to discover that the professor, Beth Caldwell, had found out about our book from the ImmigrationProfBlog last year and assigned parts of our book as reading. Caldwell is an Associate Professor at Southwestern University and is teaching a class in the Summer Law Institute at the University of Guanajuato during June attended by law students from the U.S. and Mexico. Upon meeting this past weekend, I was delighted to find out our families have some things in common, and appreciated how proactive Caldwell, who also has a background in social work, was about exposing her students to real-life stories that potential clients grapple with as a result of U.S. immigration policies. During the talk, one of the students asked whether I thought that wider awareness or better access to information would have somehow impacted our life choices in the past. It was a really hard question to answer because it can be analyzed on so many levels — the personal for both Margo and I, the political (in terms of whether greater public awareness could influence policy). Looking back, I think my answer was more cynical than I would have liked. But then many questions later I continued to make optimistic comments, especially regarding the importance of outreach. I explained that the issue is often painful, but that sharing our story was ultimately therapeutic because it ceased to become just our own personal cross to bear. By externalizing the issue, it becomes available for others to take up — or not — and I am eternally appreciative of the compassionate souls out there who righteously recognize this issue as one of universal concern and worth shouldering along with those of us who are directly affected. Exploring the many sides of this issue reminds me of discourse regarding evolving scientific matters — when something can be spun so many ways, and affects individuals, families and societies in so many ways, there aren’t really any simple answers. Discussion of the many facets of an issue can sometimes slow forward progress toward consensus. But one thing that is clear, and I knew this since before we even started writing the book, is that as long as so many people are in the dark about the very nature of our country’s immigration policies, and with so many people wanting to know the truth about the direction our country is headed in and how to steer it in a more humane and just direction, my moral obligation to speak out on the issue continues. I may not have the resources to bankroll political candidate’s campaigns in order to enact policies that are convenient to me, but I can keep participating in this discussion until I am unable, with whoever wants to join me. Perhaps auspiciously, a message in a stained glass window at the University of Guanajuato states, “La verdad os hará libres.” The truth will set you free. A mantra for us all. It will soon be a year since Amor and Exile’s publication in May 2013, and although more people than ever are speaking out and making their stories heard as to why they need immigration reform, the political scene has not advanced much in 2014. At the end of December 2013, we posted a 2013 year-in-review that summarized all the happenings in immigration reform since we had completed our book manuscript. As we go on the road several times during late spring and early summer of 2014, and celebrate a year since our publication, it’s a good idea to take a look at where we’ve come from since January and where we find ourselves now. In light of the renewed attempt to get immigration back into Congressional debates and to help American voters participate in the movement and inform themselves, the coauthors of Amor and Exile gave away nearly 1,500 copies of the Kindle version of Amor and Exile during 3 days in January. John Boehner hired a shiny new immigration policy analyst for his office, and announced that a new House plan on immigration would be revealed soon: http://www.nytimes.com/2014/01/26/us/politics/house-republicans-to-offer-broad-immigration-plan.html?_r=1. Unfortunately, we never saw any results from that grand plan. In the month of love and valentines, Amor and Exile went on the road a few times and met with broad support for reforming family-immigration. If only Congress could reflect what the majority of people seem to want. Amor and Exile had the honor of being hosted in La Penita de Jaltemba, Nayarit for a reading, and a week later, a lively discussion of Amor and Exile was held at the Cabin in Boise, ID. Nicole’s family joined her to speak about the Amor and Exile project to a group of Mexican fourth-graders at the Instituto Thomas Jefferson in Queretaro, Mexico. Even the eleven year olds “got it” better than some politicians seem to. This seemed to be the month of debate where no one could really take responsibility for this mess. Obama and Congress kept tossing the hot potato back and forth to each other, as deportations, family separations, and the living in fear and hardship for millions of families continued. Perhaps in foreshadowing to what might end up a series of painful-to-observe theatrical performances by politicians with an immigration issue prop in upcoming elections (at least for those of us affected by it), even Jeb Bush stepped out with his take on immigration, calling it an act of love: http://thinkprogress.org/immigration/2014/04/07/3423496/jeb-bush-act-of-love-border-crosser/. As if these ladies don’t know that all too well. Nicole and three friends in exile in Mexico. Photo by Jose Membrila. Nicole was the hostess of a reunion of four American women in exile in her home in Querétaro, Mexico—one newly exiled in January and the rest exiled for more than seven years. And in May, it looked like the right hand doesn’t even know what the left hand is doing… Boehner griped to Ohioans about the immigration impasse: http://www.chron.com/opinion/editorials/article/Immigration-impasse-5449547.php. I wonder what he wanted the Madison Rotarians to do about this—invite the Party over for Tea? After so many people’s hard work on this issue, it’s really getting overshadowed by endless obstructionism. To say that cultivating optimism for a positive resolution this debate is challenging would be an understatement. In our book, and in conversation with the public, we’ve seen where we’ve been, and what we currently face. The part about where we go from here is to be continued. Free Amor and Exile Kindle Ebook Giveaway, Jan. 23-24! To promote meaningful debate and public awareness about immigration, deportation and exile, we will be giving away copies of the Amor and Exile Kindle book on Thursday and Friday of this week! NOTE: We’d like to move thousands of copies of the book next week and need your help! Please plan to download a digital copy of Amor and Exile from the Kindle store next Thursday and Friday, even if you already have a copy of the book! You can use it as a backup copy, gift to a friend or use it to beef up your digital library. If you support immigration reform or human rights, please share this special opportunity with everyone in your circles! And thanks for all of your great reviews of the book as well! If you have any questions about the giveaway or how to gift a book to a friend, please email one of us. Thanks again for your support! Our giveaway resulted in over 1400 downloads of Amor and Exile in 2 days. We got into the top 500 Kindle books overall, and were #1 for political science and emigration/immigration books on Kindle for a day. Thanks to everyone who participated! Seven years ago, two women’s lives were changing forever. They both had just made commitments with men who were a persona non gratas, undocumented and unwelcome in the United States, the women’s own nation. One of the women stayed in her home country in the hopes of finding a path to stability, to live without fear. The other left and moved south, into “exile,” with the same hopes as the first. They did not know each other at the time, nor that the life paths on which they’d embarked would eventually cross. Seven years later, they know each other. Paths have now crossed. The first woman finally moved south, just as the second one was considering when she’d ever possibly return North. Seven years have passed and not much has changed, except for the birth and growth of their daughters, and some deaths — not the least of them the passing of many hopes from those early days. This past week, we welcomed Krystal and her family into our home. Krystal is a longtime blogger (currently posting at LoveMyHusbandMoreThanTheUSA, previously at A Year in the Life of Krystal) now newly fellow “exile wife,” to use the term she coined the night of our first meeting in person. It was a quick stop for them on the way to their own new home in the Central Mexican Highlands, not too far for where we live. Our meeting was surreal in many ways — first because Krystal is someone I have only “known” virtually for just over a couple years, since around the time when we began writing Amor and Exile. Secondly, Krystal’s arrival to exile is something that I’ve been “watching” her prepare for for some time now — via her public postings of her family’s struggles. As a U.S. Iraqi war veteran and mother dedicated to justice for her family, she long resisted and tried very hard to make it work for them to stay together in the United States. And so it felt somewhat monumental that one of the warriors, a legendary character from our loosely organized but broadly cast net of immigration-affected families was finally “surrendering,” and making the move into exile. A few days ago I hadn’t actually expected to meet her. I was aware of her family’s impending move south, the vague details of the approach, and where she’d be arriving. But I know how these trips go, having done one myself. When you have your whole life riding on four wheels plus the emotional momentum of a spouse only a few hours’ drive from reuniting with a family he hasn’t seen for years, your forward motion is unstoppable. Side trips beyond a brief foray at the beach seem frivolous, unreasonable even, given the main purpose of your viaje. I also assumed she’d be taking a more southerly route given her destination. So I expected to continue to wish Krystal well virtually, and mourn the inability of yet another one of us to obtain the rights to stay back home with our entire family intact. But as fast as data flies in the interworld, another member of the network tagged me in a comment that Krystal would be driving through Querétaro. Suddenly, my virtual propriety dissolved and social pressure tactics emerged. I commented that I’d be hurt not to see her — half joking, but also aware of the unique opportunity her drive through our town posed. After a flurry of Facebook messages throughout the day and finding the geographic coordinates of my house so she could locate us (we have no physical address), I discovered I would have house guests that evening after all. I quickly set about making sure that Krystal’s family’s stay would be a moment of comfort in what can be a emotionally grueling journey, having left behind everything they knew and held dear. The truth was, I needed Krystal’s visit probably as much as she needed a safe place to stay. Despite my abundant blessings, I’d become somewhat depressed recently about the lack of progress in many things I deem important in my life — all related in some way to my state of exile. Combined with a cold winter and my family being sick during the holidays, my mood was worse than blase prior to my friend’s arrival. I was trying hard to pull myself out of my funk, but it wasn’t quite working. Part of me doubted they’d actually arrive. I surmised they might either get held up in traffic a state away, or decide to push through and make it to their destination by that evening. Later Krystal confessed that her own husband had his doubts, compounded by the fact that I couldn’t give them a house address. We laughed about it once they’d arrived safely, but my husband probably would also have questioned his wife’s wisdom for taking a winding rural route on the outskirts of an unknown city in the dark night, trying to find the town of a friend she’d met on the Internet and who she was Facebook messaging with to find. But every message I received showed a location a few kilometers closer to my house, and my own husband had offered for their girls to stay in our daughter’s room so they could be comfortable (a rare move of generosity on his part, as he is often more reserved than I), an offer which I extended through the cyberwaves to her. I added that our property was gated and safe and that their dogs were welcome, after intuiting the stress that builds at the end of a ten-hour drive across a foreign country. Suddenly “they were here,” i.e. in my town, but I was still at work, and the cell phone connections weren’t working. She had thought she was lost but I told her she did better than most local friends at finding the place. I got home as fast as possible and found them at the local convenience store and they followed me home. Luckily, they’d found a taco stand across the street to grab a bite while they waited. Nicole with Krystal and her family upon their arrival. At one point, Krystal and I were sitting at the dining room table chatting a mile a minute. She had mentioned that her younger daughter understood Spanish but refused to speak it, and I responded that it’d happen naturally, eventually. As her elder daughter, who had thought I was named “Michelle” at first, sat with us sipping Lipton cup-a-soup, she asked her mom a telling question. We’d been spilling terms like “retired” and “exile,” and the eleven year old wanted to know what the e-word meant. I smiled, and let Krystal take that one. “It’s when someone has to leave their home against their will,” she explained. End of the discussion. It hit me then that the girls were aware of the journey but not fully aware of the implications of what was happening — but how could they be? Even though they were every bit a part of the collateral damage of a policy that’s in effect declared war on immigrants, these two precious, displaced souls were happy just being my daughter’s playmates for a night. And that was just fine, because in my opinion, the less you understand of the reasons behind this nonsensical forcible exodus, the better. Afterward, the girls were playing board games, reading picture books, and running joyfully about the house until bedtime could be extended no longer. After catching each other up on the various latest details of legal laments, family feuds and professional pinings, the parts that don’t get shared in Facebook statuses, we soaked in a moment to just be. Two sovereign women who, despite a lot of fear for having to leave behind something so integral to our identity — our home country — and despite having to become a part of a machisto culture that often fails to nourish our souls about us as much as our own cultures under-appreciated our partners, were still in this for the long haul, come hell or high water. Her approach to exile will be different than mine — less bound to one location, and will take a proactive stance to try and make the most of it by traveling. It’s an admirable approach, and I truly hope it brings even more satisfaction than we have found in our situation — we are truly lucky to have the house and land we do, but we are essentially bound to it until we have the means again to loosen the legal/economic ties that bind us to this location. Aside from the simply lovely aspects of having our families meet and hang out, I was struck by the nature of our reunion. How we ran to take the Facebook picture and what an achievement it felt like. How we recounted the meetings among “our kind.” When I met Crystal, when Krystal met Jennifer, when Raquel met Giselle, and so on. It’s as if every meeting is special — and it is — as we know, without articulating it, that we’re a burgeoning demographic, a movement without a leader, a spontaneous organization, allied without really wanting it — who asks for a sisterhood that is defined by a loss of autonomy? — but also absolutely needing it, growing bonds where they’ve been forcibly severed, by our own country. This kind of alliance is the kind that reminds me of spontaneous healing, where the body patches up a scratch or a cut, where positivity takes over pain without thought or intention. I saw this in my daughter’s total welcoming of strangers in her happy Spanglish and when I heard the younger one finally responding in her own adopted tongue as naturally as I assumed she would. I saw this in my daughter’s stuffed animals I found among the bedding where the girls stayed, the ones she’d lent them so they could feel a little more “home” along their journey. It was a positive force that brought our families together in the first place, the urge and instinct to unite with love rather than ostracize with hate. It’s what I wish more for our daughters’ world when we are no longer. This kind of encounter helped renew my faith that I’ve done the right things in a time when the results are sometimes so hard to live with, it’s so easy to question my own wisdom, question what the hell kind of world we are exactly living in, anyways. So thanks for stopping by, Krystal. Blessed be your journey. 2013 was a big year for Amor and Exile: True Stories of Love Across America’s Borders, to say the least! We finished the manuscript, published under our own imprint and launched in the United States and Mexico. Thanks to the outpouring of support from friends, family and supporters of immigration reform and independent journalism, Amor and Exile is now available anywhere you buy books! From our “Send Amor and Exile to Congress” campaign to sales in the U.S. and Mexico, Amor and Exile sold over 1,000 copies in 2013 — both print and Kindle. We also held 14 public readings on both sides of the border. We are happy to be contributing in a positive way to the immigration reform debate! To see the year-in-review (with photos!) of other major milestones for A&E and immigration issues, click here. We would not have been able to to pull off such a successful year without YOUR support, so we’d like to take this moment to THANK you and wish you a Happy Holidays. Review Amor and Exile, on Amazon. Positive reviews help increase our ranking and visibility on Amazon.com. Get more tips on how to do a review for us here. Spread the word. Tell your friends about A&E. Share your copy or buy one for a friend. If you have a favorite bookstore that you think might like to carry our book, send us their contact information or go in and order the book — we have Expanded Distribution that allows any bookstore to carry us. See where A&E is currently being sold here. If you know of local book clubs or schools interested in our topic, let them know about us — book clubs and schools receive a 10% discount. Help us make an impact during the 2014 Congressional debates. get in the know on immigration issues, by checking out our 2013 Year-In-Review. Stay tuned in for more ways to help here on our website. Commenting on blog posts, sharing issues on social media and contacting your representatives when bills are up for votes will go a long way toward enacting more humane immigration policies that affect families like Nicole and Margo’s, Suzie and Roberto’s, J.W. and Gabriel’s, and Veronica and Juan’s. Thanks again, happy holidays and we look forward to hearing from you in 2014. PS Read this Newsletter — and subscribe — for more occasional updates via MailChimp! 2013 was a big year for Amor and Exile and for the pro-immigration movement. Brush up on the issues of the past year with this Amor and Exile Year-In-Review for 2013. 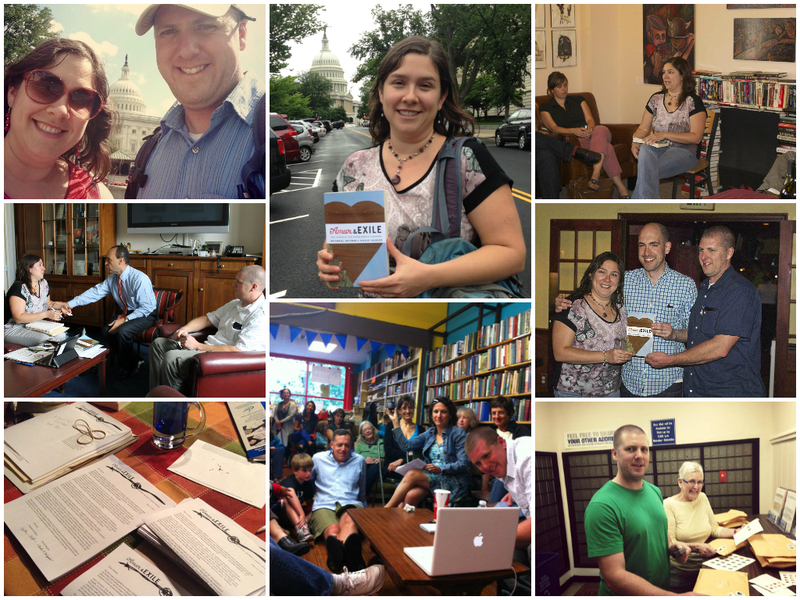 Clockwise from bottom L: Constituent letters to Congressional reps; Nicole and Nate meet with Rep. Luis Gutierrez; Nicole and Nate after hand-delivering over 100 copies of A&E; Nicole on Capitol Hill; Nicole at Ukazoo reading in Baltimore; Nicole, cover designer Gilad Foss and Nate in Baltimore; Nate and Margi Hoffman mailing books to D.C. officials; and the audience at the A&E launch at Hyde Park Books in Boise, ID. Clockwise from top: San Miguel de Allende reading, Nicole with supporter at SMA reading, U.S. citizen Edgar Falcon marries Mexican citizen Maricruz Valtierra at U.S./Mexico border in August. Nathaniel signs copies of Amor and Exile at reading at the International Institute of the Bay Area in October. Clockwise from upper L: Nate on the air with Nicole on the Midday with Dan Rodricks show; Nicole skyping in from Mexico with Deyanira and Ben at Rediscovered Books reading; the audience at the RD Books reading in Boise; the audience at the reading at the Jefferson Clinton Hotel in Syracuse, NY; Nicole and her grandmother, Thelma Kinney, at the Syracuse reading, the day before Thanksgiving. A&E has sold over 1,000 copies and hosted 14 public readings in the U.S. and Mexico in its first six months. Giveaway days planned in January to coincide with the start of the Congressional session, to help elevate the debate on immigration reform—stay tuned!